As I've landed in Sofia and I'm staying few days in a friend thus I had the opportunity to take a quick look over one of the oldest cities in Europa. 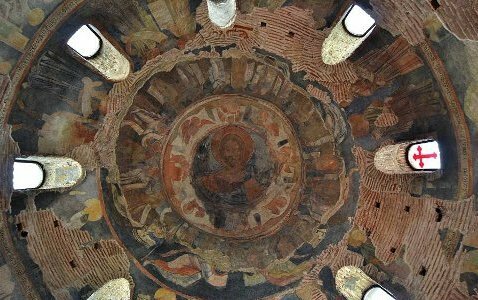 Sofia is known under the ancient name Sredets and is dates back to times before Christ. Yesterday I had a walk near NDK (ÐÐ°Ñ†Ð¸Ð¾Ð½Ð°Ð»ÐµÐ½ Ð”Ñ€Ð¾Ð²Ñ€ÐµÑ† Ð½Ð° ÐšÑƒÐ»Ñ‚ÑƒÑ€Ð°Ñ‚Ð° – National Palace of Culture), nearby I saw a little Church which looks orthodox. I dropped by to pray and light up a candle as I usually do when I see an Orthodox Church building I was not in before. In front of Church I saw a priest which looked pretty much like Orthodox, Church interior looked strange as it contained a mosaic of Christ's face which seemed a bit like Catholic. I spoke a little with the priest asking him if he is priest or monk (in orthodox Church we have priest – who marry and monks who didn't). He said he is a Bishop which puzzled me since it is not very common a Bishop to smoke cigarette in front of a tiny Church building …. Later I understood he is from the so called Schismatic Synod – the so called Alternative Synod which claimed our last Church patriarch Patriarch Maxim is not choosen canonically because he was choosen in communist times) ….. I deeply regretted I had the misfortune to enter a schismatic – heretic Church and quickened to leave. 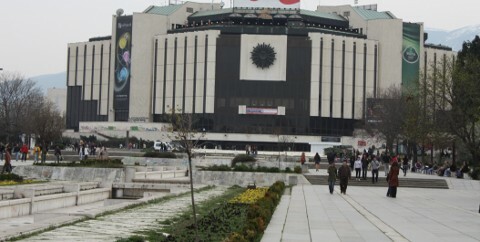 Just on the street from NDK Enormous Building which is one of the most well known places in Sofia center. 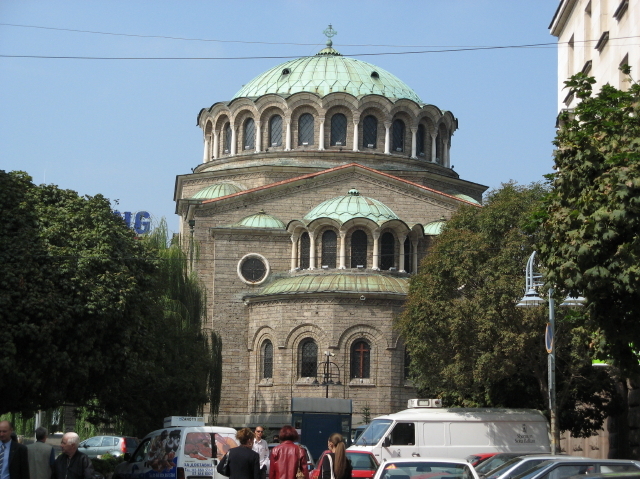 I saw in the end of the street a huge Orthdox Cathedral and though it is the biggest Orthodox Cathedral in the balkans – st. Alexander Nevski. Now it is good time to write about great God's providence. I very much wanted to venerate st. King Milutin for some time, since the moment I heard his holy relics are kept in my homeland capital Sofia. In Nijmegen where I was going to church in the Serbian Church, I had the opportunity to venerate a little particle of st. Stephen Milutin's holy relics and actually it is from where I heard from a first time for this saint. Many saints in our holy Orthodox church has incorruptable bodies like st. Stephen Milutin but so far I never had the opportunity to see such a great unexplainable by science miracle, where a saints body is preserved incorruptable for 9 centuries!!!! St. Uroš II (Stephan) Milutin NemanjiÄ‡ who was a ruler of Serbia and one of the biggest contributors and donators of Serbian Church ruled over Serbia for 45 years, over this 45 years he donated a multitude of villages, money provisions, gold and all goods to serbian Church. He had promised to God to build so many churches as his years of rulership will be he stand up to his promise and build 45 Churches over his 45 years of rulership. He was well known for dressing in beggar cloak and going out of his castle to be among poor people and often bring them food, clothes and money. In his rulership his greatest stronghold and hope was the Holy Orthodox Church. st. King Stephan Milutin made a lot of donations for Monastiers including the building of newer and more beautiful Church building and a protection tower in Serbian Monastery in Holy Mount Athos Hilendar. St. Stephan is born in y. 1253 and passed away to Christ in October 29, 1321. Here is a picture someone has taken of st. Stephan Milutin Holy incorruptable body. More complete living of st. Stephan Milutin can be read on Orthodox Wiki here. The size of St. Nedelya Cathedral is impressive, the whole church is full of beautiful icons. It is keeping also a miracle making icon of the Holy Theotokos Virgin Mary – the well known – Joy of all sorrowful. If you happen to drop by the temple you can find it on the left of the entrance / exit door of the Church. The Holy iconostasis of the Church is all in Gold, the dome of the Church contains most beautiful images of Christ surrounded by Angels the fresco seems quite ancient though I'm not sure from which year it dates back. In the right of the Church entrance door is found the grave of exarch Stephan – the head of the Bulgarian Orthodox Church after the liberation of Bulgaria from Ottoman Turkish 500 years long slavery. The Church is a functional and Holy Liturgy is served every day also an evening service is done everyday. St. Nedelya Cathedral original building dates back from the ancient 10-th century and is connected to a times, where Slavonic translations of the Holy Bible was still young. Going out of St. Nedelya Church just few meters away is located another Christian Church in glory of St. Petka of the Balkans (The Bulgarian). There was times where holy relics of Saint Petka Bylgarska, holy relics resided in that catacomb ancient Christian church. In st. Petka Church there is a small book where one can write all the miracles that happened of people who prayed for prayed to Christ for their various needs, physical healing etc. Also something that strike me in this little Church was the odor in the air which is typical to smell from holy relics of saints. Just 20 meters away from saint Petka's Ancient Church is located another more ancient Church from the 4th CENTURY in veneration of Saint Martyr George the Glorybringer! 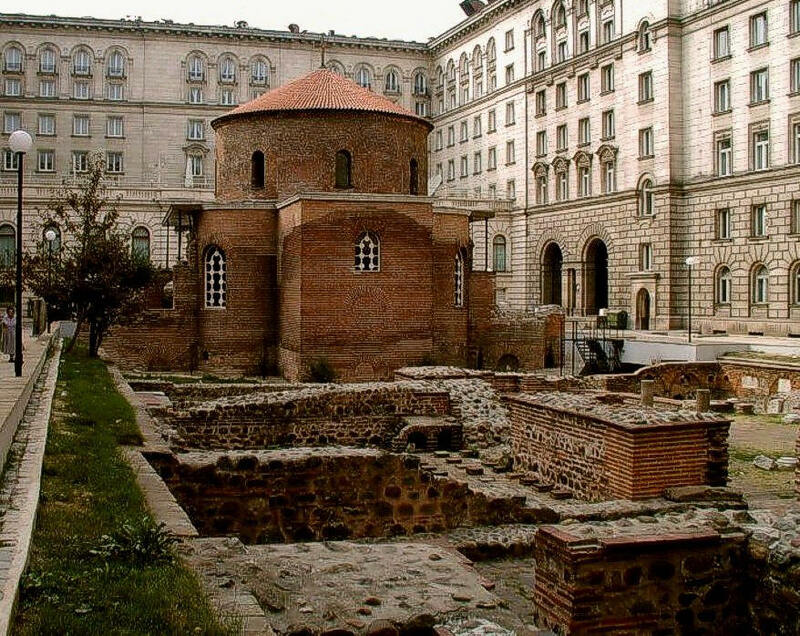 The Rotunda st. George is something must see for anyone that never was in Sofia before and I thank God for being able to pilgrimage on such an early Christian church. The story line of Saint George Church is pretty long and the visitor can read it. In short as I read the Church has three layers of icon paintings from 3 different periods of the Church use, the most ancient found one dates back from the 6th century. The Church was used mainly for baptismals in a long time of its existence. Today there is a Holy Liturgy and evening prayer service daily and Church is fully functional and conducting its original purpose of bringing people to Christ. Into great depression – What is like to live in the Balkans? This entry was posted on Friday, January 25th, 2013 at 12:50 am	and is filed under Christianity. You can follow any responses to this entry through the RSS 2.0 feed. You can leave a response, or trackback from your own site. aint Stephen was the younger son of King Stephen Urosh I, and grandson of First-Crowned King St Stephen (September 24). 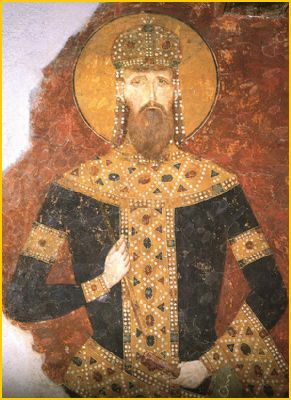 He ruled Serbia from 1275 to 1320.